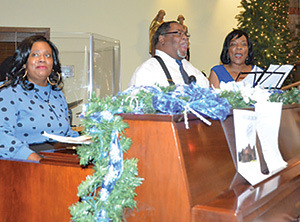 A welcome mat of excitement and hospitality was rolled out to usher people into a Mass closing out a yearlong 100th anniversary celebration at St. Francis Xavier Church in Baton Rouge on Dec. 30. Members of the Knights of Peter ladies auxiliary dressed elegantly in white smiled to passersby as they prepared to take group photos, with the Knights dressed in regalia standing nearby. Ushers greeted people and opened the door to a church brimming with people and a soulful Gospel prelude before the liturgy. “Today we celebrate 100 years – 100 years,” said Father Roderick Coates SSJ in his homily, and applause rolled across the church. Father Coates, a Baton Rouge native, has served as priest and Josephite leader for more than 25 years. Since its incorporation, St. Francis Xavier has experienced much suffering which has only made it stronger, Father Coates noted. On Christmas Day, 1918, parishioners sat on borrowed chairs to celebrate the first Mass in a mostly completed church, a little red brick building on the corner of Julia and South 11th streets. There was no heat and the windows were not firmly in place, according to records. In 1920, under the guidance of then pastor Father Leo Murphy and Sisters of the Holy Family, St. Francis Xavier School was opened in Baton Rouge. In 1956, a newly built St. Francis Xavier High School was dedicated. The children of St. Francis Xavier present a tribute to Mary. There was other growth of the church’s physical plant. The skilled craftsmen, called “mechanics” by then pastor Father Thomas McNamara, expanded the church in time for Christmas Mass in 1935. In 1938 the “mechanics” constructed the church’s auditorium, which was the largest facility for African Americans in Baton Rouge, according to the church’s records. St. Francis Xavier also expanded evangelical efforts in Scotlandville and Southern University. Then pastor Father Edward Ledoux opened a north Baton Rouge mission, celebrating Mass in the Cook Theater for seven years. When Father Francis Carney became pastor, the St. Francis Xavier “mechanics” built a mission church. 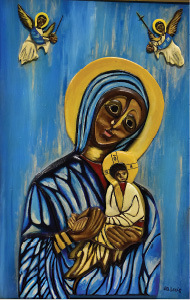 In 1958, the Scotlandville mission became Immaculate Conception of the Blessed Virgin Mary, the second Josephite church parish in Baton Rouge. But further challenges threated to tear St. Francis Xavier apart, according to church leaders. In 1961, Interstate-110 carved a path straight through the high school building. The interstate construction forced many families to move, but they continued to attend St. Francis Xavier. “Against the odds” the school prospered and then pastor Father George Wilson and the parish “mechanics” built a new school from proceeds of the settlement with the state over the high school and parish fundraisers. Before his retirement, Bishop Robert E. Tracy approved construction of a new church to replace the old church damaged by construction. Bishop Joseph V. Sullivan dedicated the building in 1978. More recently, parishioners collected $150,000 and new pews and flooring were installed and a handicap-accessible bathroom constructed. Father Coates said St. Francis Xavier has made it through the challenges of segregation, discrimination and interstate construction with the support of the Josephite fathers, the Sisters of the Holy Family and determination of church founders to have a “home” to worship in that has been passed down to the current generation. 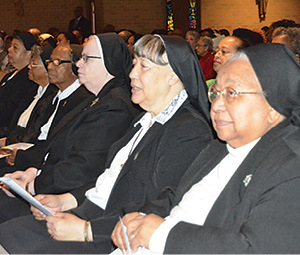 The Sisters of the Holy Family were among those recognized for the congregation’s leadership at St. Francis Xavier Church and School. “(In the next 100 years) though the faces will be different, the message will be the same. We will not fail, we will triumph, we will bless others through God’s grace,” Father Coates said. In his remarks, Bishop Michael G. Duca said despite the pain of illness and sorrow, people have stepped forth to serve. 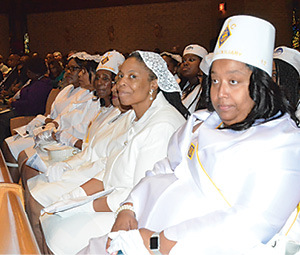 “Through the sacrifice of the Josephite Fathers, the Sisters of the Holy Family and countless numbers of dedicated parishioners, you have been a shining light in the Old South Baton Rouge Community,” said Bishop Duca. He encouraged the congregation to urge the next generation to step forward in service through vocations to the priesthood and religious life. Parishioner’s faces were alight as they spoke about the importance of the church’s celebration. “It’s inspiring that through all the struggles and tribulations people fought and never gave up to give us all that we have today,” said Roderick Thymes. Stephanie Domingue noted despite St. Francis Xavier’s losses, it flourishes. “We’re still here, we’re still strong, and we still have a grade school,” said Domingue. “My grandparents brought me up in the parish and it and it’s a special grace for me to help others experience the gifts this parish offers,” said Williams. Gen. Russel Honore delivered a stern but inspiring message later that evening to nearly 400 patrons who gathered at the Atrium at the Belle Casino for a dinner buffet and a night of dancing. Honore, a Lakeland native and Baton Rouge resident, said he knows and understands the value of Catholic education. He talked of the sacrifices he and his wife made so their four children were able to attend Catholic schools. Honore, who helped restore order to New Orleans in the chaotic days following Hurricane Katrina as commander of the Joint Task Force Katrina, said Catholic school students have helped change Baton Rouge for the better in the past and will continue to do so in the present and the future. 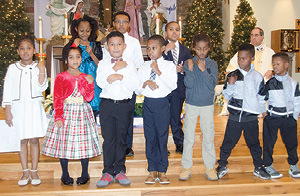 “It’s not where we’ve been but where we are going,” Honore said, adding that Catholic families should be inspired to send their children to Catholic schools. 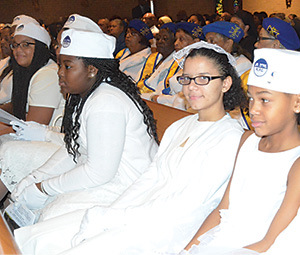 The Junior Daughters of the Knights of Peter Claver were on hand during Mass. He also urged parish leaders to look forward to the next 100 years. He also encouraged patrons to challenge the social and economic disparities present in the 21st century. “Our nation is changing,” he said. “More then 50 percent of immigrants are Catholics. How do we tap into that community? Honore said the best legacy parents can leave is to raise “good kids.” But he noted that in today’s evolving society dependent on modern technology that has dramatically influenced the family landscape, child rearing is not easy. He said having children means parents must sacrifice, and said parents must provide a stable at foundation, including teaching children how to pray. Bishop Duca blessed the food and deliver the opening prayer, and also welcoming patrons were Father Michael Thompson SSJ, superior general of the Society of St. Joseph; Sister M. Leona Brunter SSF, congregational leader of the Sisters of the Holy Family, parishioner Lorina Turner and state Representative Edmond Jordan. Richard Meek contributed to this story. 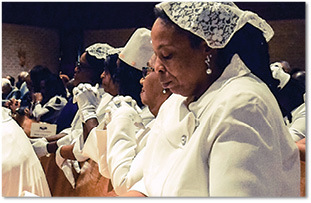 Many Ladies Auxiliary of the Knights of Peter Claver were present during the Centennial Celebration Mass.